Simply Soccer Camps - Join Our Email Club! 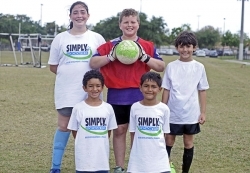 The Simply Soccer camp is in its 31st year of soccer camps in Coral Springs. The camp is for boys and girls, ages 5-15, and of all skill levels, who will be taught a variety of soccer skills from dribbling to shooting. It is the longest running soccer camp in Coral Springs! There are three sessions each day ranging from 9 a.m. to 3 p.m. ($160); extended hours camp from 8 a.m. to 4 p.m. ($175), and a Tiny Tot program for kids ages 5 and 6 from 9 a.m. to 12 noon ($85). Full day campers must bring a soccer ball, swimsuit, shin guards, water bottle, and lunch. You do not have to be a city resident to attend. Register daily from 8 a.m. to 9 p.m. at the Coral Springs Gymnasium, 2501 Coral Springs Drive, Coral Springs. For info call 954-345-2200. Congratulations to the "Red Assasins," for winning the Simply Soccer Camp Spring Break tournament championship. We are looking forward to another record-breaking summer and hope to see you in June for our summer series. We are also stoked for the Women's FIFA World Cup! 2019 World Cup Spring Break winners ! Our 2019 camps are in full swing. Registration has begun for our Summer camp series beginning in June 2019! You can register at the Coral Springs Gymnasium from 8 a.m. to 9 p.m. daily. June 10-14; June 17-21; June 24-28; July 1-5 (No camp 7/4); July 8-12; July 15-19; July 22-26; July 29-August 2; August 5-9.